Welcome to the last post in our spring book study. 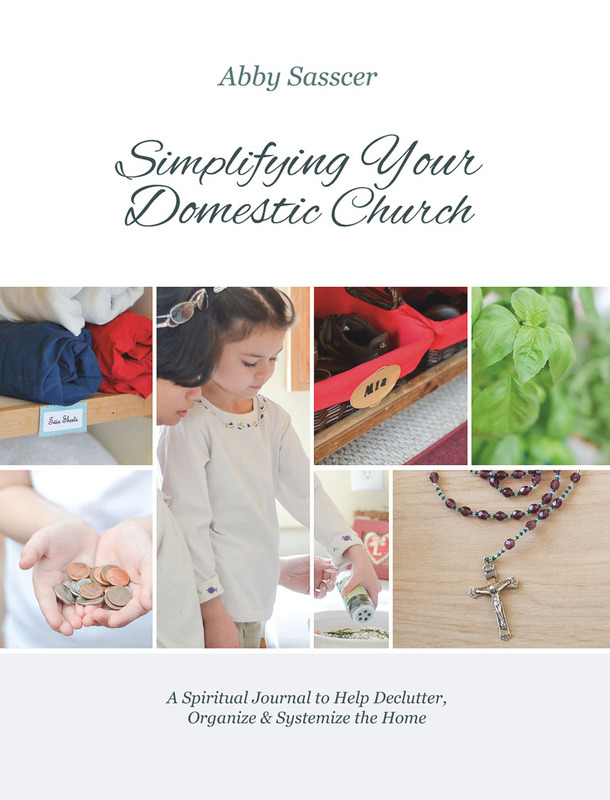 We have been working our way through Abby’s beautiful book (which is very much a journal as well) with the goal of simplifying our homes. This process not only helps clear the home of junk and clutter but it also serves to de-clutter ourselves from our attachments and help to develop good habits going forward. The book approaches simplifying from a Catholic spiritual place and leads us to a desire to place God first in our lives. This last section deals with creating a vital documents file. It’s not the kind of chore that anyone relishes or even really considers doing until there is some type of emergency, unexpected death or tragedy, and we are suddenly faced with trying to find insurance papers, mortgage papers, birth records or a myriad of other documents and records. It’s a terribly stressful thing to think about at an already stressful/sad time. In the first paragraphs of this section Abby asks us to consider taking care of these temporal matters now so that when we are on our deathbeds we need only consider preparing our souls. Such good and though provoking advice because we are not really meant for this world so our focus at the time of our leaving it should not be hurried arrangements and frantic paperwork. Having vital documents file which helps provide for our last needs and our remaining family will bring peace to ourselves and our loved ones. In the practical tips portion Abby, very thoroughly, provides a list of the types of records that a vital documents file should contain. She also provides a form that allows us to check off which documents we have put in the file creating a quick index for us. This could be extremely useful for a time when something is needed quickly. It is a good idea, when making these kinds of plans, to consult your tax advisor and your attorney about making provisions for your final expenses and protecting your assets. Reviewing these provisions on a regular basis is also a good idea since circumstances often change and you want your tax plan and will to be as up to date as possible. Do you have such a file? If so where is it? Is it safe in case of fire or flood? All these questions need to have answers, tedious and time consuming as it might be now, you will be grateful to have it settled should the need arise. I would like to thank everyone for joining us in this book study as well as Abby Sasscer for allowing me to share her work with you. That link will take you to where you can purchase the book, if you have not already done so.